PROFILE / HISTORY　TACHIKAWA CORPORATION / TACHIKAWA TRADING CO., LTD. Founded in 1938, Tachikawa Corporation is the pioneer in the production of venetian blinds, window covering products, and room partitions in Japan. 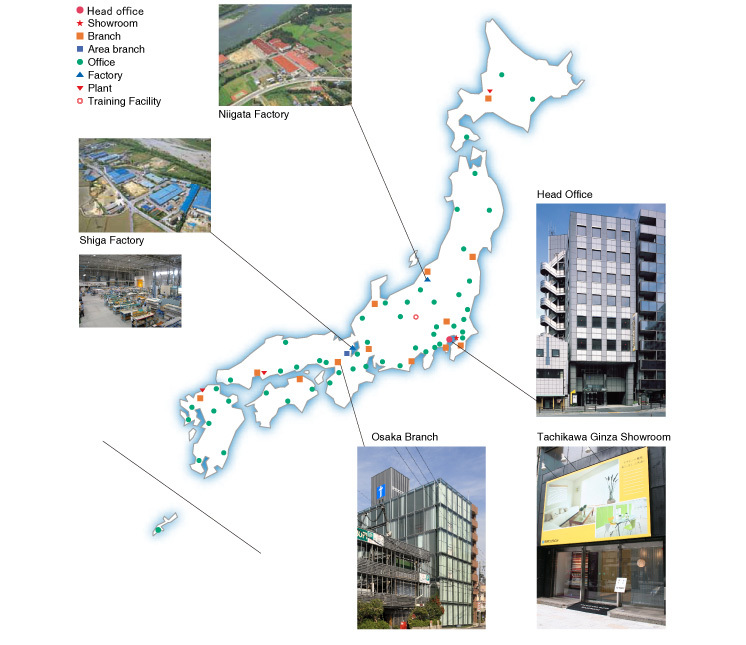 There are two factories and three works in Japan, and there are business bases in 67 locations throughout the country. Products handled include interior products for the home, for the office, and for public buildings. 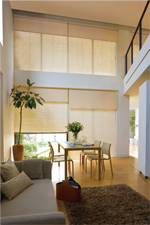 Tachikawa also manufactures vertical blinds, roller blinds, roman shade, pleated shade, curtain rails, and other window coverings and interior finishings. Since its foundation, "Contributing to society through improving the living environment for inside and outside the building" is a basic management policy. Tachikawa has developed their products to gain customer confidence and satisfaction by "Creating a more comfortable living space". Founded in 1994, They at "Tachikawa Trading Co.,Ltd." handle overseas transactions for Tachikawa Corporation as the parent company. We have been doing business with overseas customers for commercial projects, fabricators of window coverings, exporters, importers, designers, general contractors, etc. Manufacturing, sales, marketing, design and installation, etc. of various window covering products and room partitions. The permission of the Minister of Land, Infrastructure, Transport and Tourism has been obtained for architectural construction, interior finishing, fittings construction and machinery and appliance installation. Japan-besed company mainly engaged in the manufacturing and sale of parking system,geared motor,motorized panel louver,and movable partitions. Tachikawa Manufacturing Co., Ltd. founded by Takeyoshi Tachikawa in Yanagibashi, Taito-ku, Tokyo; the company initially manufactures and sells window blinds made of cloth and wood. Under the new name Tachikawa Corporation, the company reorganizes, produces wooden and duralumin blinds, and supplies facilities for the stationed troops as well as municipal buildings during the recovery. The Osaka office is established in order to make inroads in major cities nationwide, and beginning with Fukuoka, ten offices are subsequently established from December 1958 to October 1966. The Accordion Curtain partition for regular residential use is launched. The current Tachikawa Kikou Co., Ltd. is established (currently a consolidated subsidiary) with the objective of manufacturing parts for Tachikawa Corporation products as well as curtain rails. A new factory is established in Aichi County, Shiga Prefecture (currently,? Shiga Factory). Integrated intensive production is launched for all products. Offices are established in major cities nationwide through 1976. Silky interior blinds are launched. The Ginza Showroom is opened. In order to divide the nationwide production base in two from western Japan, an eastern Japan factory is established in Agano City, Niigata Prefecture (currently, Niigata Factory). The corporation is connected with computers online nationwide?from receiving orders, to production, to shipping. Business and capital tie-up with Fuji Hensokuki Co., Ltd. (currently a consolidated subsidiary). Head office is moved to Shibuya, Tokyo. The Sapporo Plant is established in Sapporo City as a production base in the Hokkaido area. The Fukuoka Plant is established in Kaho-gun, Fukuoka Prefecture as a production base in the Kyushu area. Company stock is listed on the Tokyo Tento Shijo (over-the-counter securities exchange). Silky Curtain interior blinds are launched. Branches are established in Tokyo, Osaka, Nagoya, Sapporo, Sendai, Hiroshima, and Fukuoka. By February of 1989, subsequent branches were established in Yokohama, Kyoto, Shizuoka, Niigata, and Kanto. Tachikawa Sohbi Co., Ltd. (currently a consolidated subsidiary) was established with the objective of interior and exterior equipment design, construction, and sales. Company stock is listed on the Second Section of the Tokyo Stock Exchange. The Hiroshima Plant is established in Kure City, Hiroshima Prefecture as a production base in the Chugoku/Shikoku area. Branches are established in Kanazawa and Takamatsu. Head office is moved to Kaigan, Minato-ku, Tokyo. Branches are established in Chiba and Kobe. The mandatory unit of transaction is reduced, and the Tokyo Stock Exchange selects us as Premier company in valuing shareholders. Consolidated subsidiary Fuji Hensokuki Co., Ltd. is listed on the Second Section of the Nagoya Stock Exchange. Tachikawa Trading Co., Ltd is established. Continuing on from the launch of the Curtain Rail V21, curtain rail products are expanded through 2002. Roman Shade Creas is launched. Foretia wooden blinds are launched. Pelre pleats screens are launched. The Silky Aqua and Silky Curtain Aqua interior blinds are launched. ISO9001 (2000 version) certification is obtained on a nationwide scope. Tachikawa Shanghai Corporation. (currently a consolidated subsidiary) is established in Shanghai, China, with the objective of producing and selling all kinds of blinds, partitions, and the like. ISO14001 certification is obtained at the Niigata Factory, and in November 2003, the scope is expanded to the Shiga Factory. Place panel partitions are launched. Creas Panel Curtains are launched. After Beat sentient blinds are launched. Head office is moved to Mita, Minato-ku, Tokyo (current location). Total renewal of Roll Screen. Pelre Cert pleats screens are launched. The Home Tacos residential electric product series is launched.